Kolkata Knight Riders (KKR) take on Delhi Capitals (DC), formerly Delhi Daredevils (DD) in the Indian Premier League 2019 (IPL 2019) match number 26 at the Eden Gardens in Kolkata. This will be the second encounter between Kolkata and Delhi this season. In their earlier meeting in Delhi, Capitals emerged victorious via a Super Over. And now Kolkata Knight Riders will be looking to take revenge of the defeat in front of their home crowd. Kolkata Knight Riders vs Delhi Capitals Live Cricket Score. 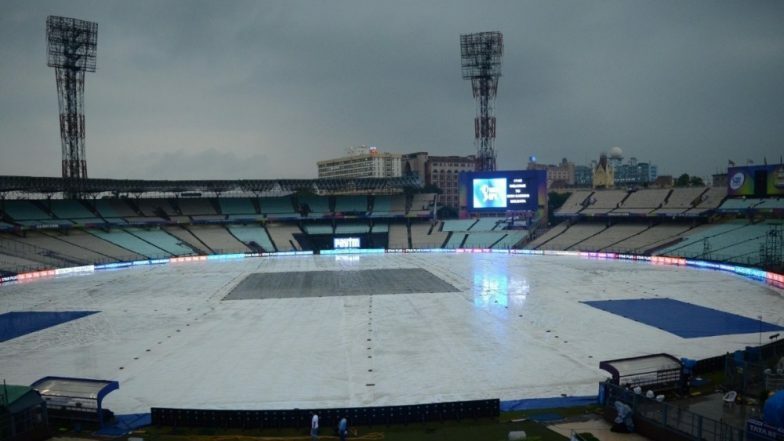 The temperature in Kolkata is on the higher side of the thirties, but during the game time, as per Accu Weather, the temperature will be under 30 degrees. There are some chances of rain as well in Kolkata. However, during the match, the weather is expected to stay dry. Humidity will be on the higher side at around 80-90%. KKR vs DC, Head-to-Head Record: Ahead of IPL 2019 Clash, Here Are Match Results of Last 5 Kolkata Knight Rider vs Delhi Capitals Encounters! Pitch Report: The pitch at Eden Gardens is expected to have some grass on it and thus will assist fast bowlers more. However, the two matches at the venue this season thus far have been high scoring ones. KKR vs DC, IPL 2019 Match 26, Key Players: Andre Russell to Rishabh Pant to Robin Uthappa, These Cricketers Are to Watch Out for at Eden Gardens. Delhi Capitals Squad: Prithvi Shaw, Shikhar Dhawan, Shreyas Iyer(c), Colin Ingram, Rishabh Pant(w), Chris Morris, Axar Patel, Rahul Tewatia, Kagiso Rabada, Ishant Sharma, Sandeep Lamichhane, Hanuma Vihari, Colin Munro, Ankush Bains, Harshal Patel, Manjot Kalra, Keemo Paul, Sherfane Rutherford, Jalaj Saxena, Amit Mishra, Trent Boult, Avesh Khan, Nathu Singh, Bandaru Ayyappa. Kolkata Knight Riders Squad: Chris Lynn, Sunil Narine, Robin Uthappa, Nitish Rana, Dinesh Karthik(w/c), Shubman Gill, Andre Russell, Piyush Chawla, Kuldeep Yadav, Prasidh Krishna, Harry Gurney, Rinku Singh, Nikhil Naik, Joe Denly, Shrikant Mundhe, Carlos Brathwaite, Sandeep Warrier, Lockie Ferguson, Yarra Prithviraj, KC Cariappa, Matthew Kelly.